On or about Monday, Mar. 12, from 6 p.m. until midnight, the right lane of Saarinen Circle, directly in front of the Dulles Airport Metrorail Station construction site, as well as the right lane of the Copilot Way ramp, will be closed to allow Dulles Corridor Metrorail Project crews to temporarily relocate construction (Jersey) barriers so work on the station's water line may continue. Access to the Dulles Terminal, adjacent surface parking lots, Copilot Way, and Garage 2 will be maintained throughout the work activity. 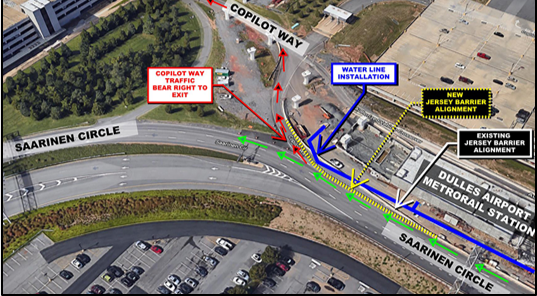 Signage will direct vehicles requiring access to Copilot Way and Garage 2 to turn right onto the Copilot Way Ramp, just beyond the construction (Jersey) barriers. The barrier relocation will remain in place for one to two weeks. Please see the drawing below. Drivers are asked to use caution and remain attentive to all signage and barricades. Large, slow-moving vehicles may be exiting and entering the roadway at various times. All work is weather dependent and subject to change.